Having trouble getting approved? 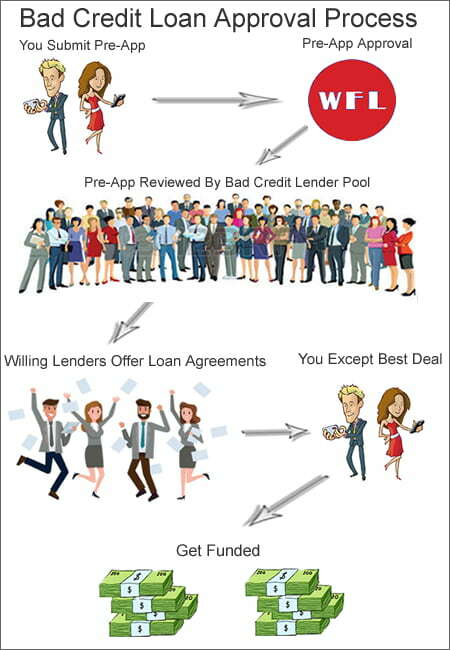 If you have a poor credit rating and a FICO score below 650 it's very hard to find lenders who will do business with you, AND charge a reasonable interest rate. We know. We've done the research. This is where we come in. Here is a short list of reasons why we can help you. "We had a really bad year. I totalled off my car in an accident and my husband was badly hurt. We don't have any equity in our house to borrow off so we were desperate to look after our medical bills and just make ends meet. Both my husband and I have had credit due to our small business collapsing as well. Both of our credit scores were below 500 and we thought we may end up on the street. Thanks to the WFL service we got approved in two weeks for a loan for $50,000. We had 4 offers in our email the same week we applied. We can't thank you or recommend you enough for your helpful service". - Angela Bowman in Las Vegas NV. We have hundreds of testimonials like these. We sincerely hope you will try our free service and get approved for the financing you require. When you do, please send us an email to let us know what your experience was like. You can apply here using our Standard Loan App method if you don't want to read about the usury laws in your State regarding APR, interest, and fees. However we encourage you to use the Fast Loan App method. Each lender's fee structure is different but this loan calculator will give you the basic idea of what you will be looking at in regards to how much you pay in interest, your monthly payment, and the total monies paid back to the lender.